More than 700.000 visitors since December 27th, 1995. Although the cube had been invented as early as 1975 by Ernö Rubik, the cube fever spread only in 1980 to last until 1983. Some clubs and newsletters popped up only to vanish after some months / issues. But since the use of internet has been established world-wide, the cube has been kissed to life once again. And the cube is feeling fine! Here is the gallery of my cube collection (updated March 1st, 2010). I sold cubes of good quality This sale has come to an end after having sold nearly 2000 cubes. All my customers are happy with them. I have very few left. Have a look at my online shop to see what is available. 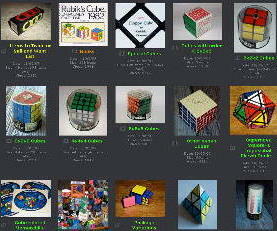 Here is my list of cubes and cube-related puzzles. Online solutions to the 2x2x2, 3x3x3 and 4x4x4 cubes at www.helm.lu. If you remember the title of a book but not its author, browse the alphabetical title list. The programming (php) for this list has been done by my son for my anniversary. Thank you Pierre! I have some spare cube books which I am willing to sell (see my online shop). 29.9.2006 - Great News! I have a 7x7x7 cube! From left to right: Krell 5x5x5 cube, Acryl magnetic 3x3x3, black plastic 5x5x5 and white plastic 5x5x5 by Mr. Verdes, black plastic 7x7x7 and two 6x6x6 cubes by Mr. Verdes. In my hands a white plastic 7x7x7. Thank you, Mr Verdes! I get younger and younger with the invention you made! 5x5x5 black plastic / 5x5x5 white plastic / 6x6x6 white plastic and 7x7x7 white plastic! 25.6.2005 - I have a 6x6x6 cube! Look at my gallery (scroll down to 6x6x6 cubes) to see some pics or click the above photo to see some moves on the 6x6x6. And more nxnxn cubes to come soon, where n > 6. Mr Βερδές, a Greek inventor, has patented a new system that makes it possible to construct these cubes. Have a look at his "V-Cubes" site now and enjoy! The only club still existing and still publishing a regular newsletter is the Nederlandse Kubus Club (NKC). At first in Dutch, the newsletter is published in English since members from all over the world did subscribe. Though the cube is not forgotten, the newsletter covers other puzzles as well. Submissions for Cubism for Fun (CFF) should be sent to Rik van Grol, . Back issues are available for members. Details on how to get them, see CFF backissue page at the NKC site. Applications for membership should be sent to the Treasurer. To get the address of the Treasurer, please send a request to Rik van Grol . In issue #25 of CFF I published an article "Ten Years of Cubic Mags". From the beginning of 1980, a mailing-list had been established at MIT. The archive of the list was available via anonymous ftp at cube-lovers. Since the archives are no longer available at the ftp-site of the MIT, I am hosting a copy from 2002 at my server. The last entry is from 'der Mouse' from 27.01.2000. I have also mirrored the /contrib directory of the archive. Diego de Pereda writes: I have created a website to show how to solve a Rubik's cube with images (no notation at all), where to buy it, world records, curiosities and more stuff related with the Rubik's Cube. It has been translated (by cubelovers, not machines) to more than 10 languages. Frank Tiex' cubecorner. "I hope it is a valuable and helpful site to keep dates and details on all the items created in the near and former past. Everybody's invited to add new puzzles, content and pictures." Have a look, you won't be disappointed! 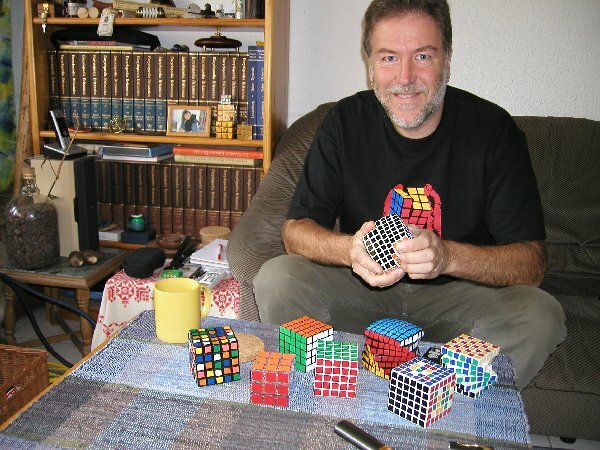 a great Spanish site by Juan Roure: Juan y el cubo de Rubik. Hola Juan! A Rubik's Cube Timer is offered by Benoit. I am no speedcuber and have no intention of becoming one, so if you want, tell me about how you experience it. Michael Reid's Rubik's cube page is here. Michael has very valuable information on his pages, quick to download and up-to-date. His here Here is an online solution from a Danish cube solver, mbs. Nice gif animations for this simple beginners solution of the Rubik's Cube. Ton Dennenbroek Rubik's Puzzle Building, The art of speedcubing and more! Joshua has a very complete page on Magic Polyhedra* Patents. Two great places to visit! Rubik's 'Tesseract' (KAMACK H.J./KEANE T.R. 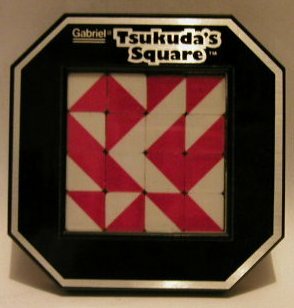 ;The Rubik tesseract;Newark;1982) is online at last. It is called Magic cube 4D by its authors Melinda Green, Don Hatch, Roice Nelson and E. Jay Berkenbilt. You may download the 'Tesseract' paper here or from the authors page above. For all those who want to go even farther, here is a 3^5 computer puzzle which extends the 4D tesseract puzzle (MagicCube4D) another dimension by Roice Nelson and Charlie Nevill. [Update 24.11.2009]This note is to let you know that we've recently updated our 4D Rubik's cube to version 4.0. ... our new version supports a whole zoo of other beautiful 4D puzzle shapes besides just the cube. My small pretty patterns page. A solution to square-1 can be found here. Jaap Scherphuis has a great puzzle page. 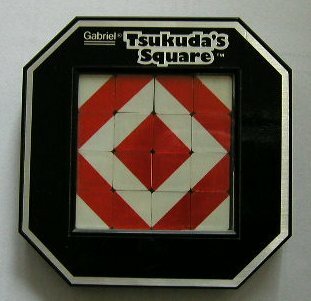 I spent hours and hours there: dozens and dozens of solutions to most of all available interlocking puzzles from the 2x2x2 to square-1 and Tsukuda's Square . You will be delighted! has a large and unique collection of brain teasers & puzzles for sale. In addition they also carry chess, mechanical banks, puzzle books, magic trick books, boomerangs, etc. Puzzle Master now (1.10.2012) also has a puzzle blog: the Passion for Puzzles Blog. Passion for Puzzles is a fantastic site for all kinds of puzzles. You can find solutions for brain teasers. There is also a great section for online games and another section for daily online activities like crosswords, sudoku, word search etc. Buy some very interesting Rubik's cubes and other puzzles at Uwe is the inventor of the 5x5x5 cube (Professor cube) and I have experienced a very good service when buying from him. I am still interested in getting solution book(lets) I do not yet have. Don't hesitate to e-mail me. Once upon a time... there were some cube-related magazines. In 1991 CFF published an article by myself entitled 'Ten Years of Cubic Mags'. The best solution I know of so far for square-1 is in the pilot edition of Puzzle World. The solution is by L.E. Hordern. "Rubik's Cube: The Ultimate Solution" (mirror on helm.lu) uses a method unlike any other I have seen either on or off the internet, says Philip Marshall It uses only two series (a four turn series places edge pieces and an eight turn series places corner pieces) and completes a scrambled cube in an average of 65 moves. On June 28th, 1999, Philip informed me that "I now have solutions for all three of Rubik's cubes on the internet." All solutions to be found above. Someone has expanded on Philipp's method and gives clarifications here at his blog. His blog has video tutorials to 50+ puzzles, including many of the new "crazy" type puzzles. 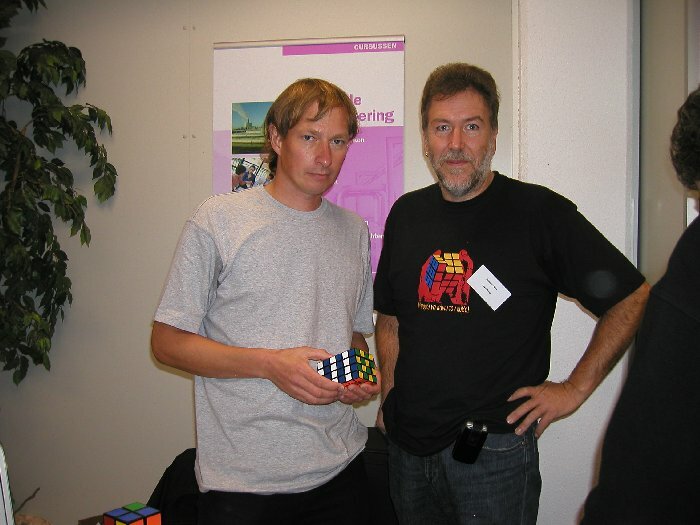 Ernö Rubik himself has opened a page on the web. Well, in fact he has nothing to do with the site, just giving his name. They sell official cubes and a Java cube and information on his other puzzles with solving hints can be found there. 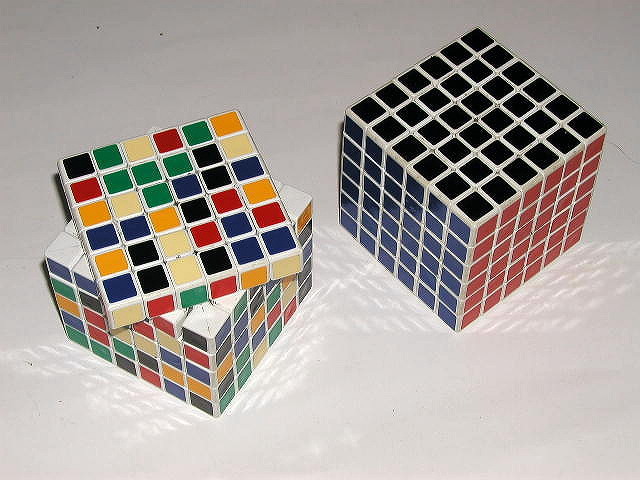 Here (Robs Rubik site) you can let a cgi-program solve *your* scrambled cube that is lying around at home or in the office. Simply enter the colors of each face and click. Presto! The solution appears like magic. Last updated on October 13th, 2018.